Me and strawberries are going through the wringer this week. It started with a large, plank-like shortcake with cream cheese, sour cream and a buttered center. It was a dud, an all-caps level DUD. I should have known better than to try a recipe from a dubious source, and also to mess with a perfect thing. Next came a strawberry-striped tweak on my favorite crumb cake, except it didn’t really stripe and when released from the pan, stood briefly on the counter, sighed then slumped wobbily to the side. Filed under: delicious dud hanging out in the freezer, waiting for the next barbecue invitation. Third came a [we’ll talk about it later] which I was attempting for the [that too] and it is all sorts of magically tasty if you can look back the large crater in the middle, as if strawberry filling had recently erupted from within it. Filed under: another delicious disaster and lordy, my freezer is getting full. Recipe four was tasty, but I’m debating whether it’s worth burdening your time to discuss; I will ponder this over my next serving but recipe five, recipe five is the real reason we’re here today. It started with an apple brown betty, and my recent realization that I have never tried one. Butter + crumbs + sugar = what is wrong with me? Obvious that. Then I found a link I’d bookmarked eons ago to tiny brown bettys, molded in muffin tins, a web recipe from the late Gourmet Magazine. [Moment of silence.] And where it said “good-quality sandwich bread”, I read “Wonder Bread” because I can get it at the bodega. Where it said, “Gala or Fuji apples”, I read “South Jersey strawberries” because I can’t stop buying them. Where it said, “light brown sugar and cinnamon”, I read “dark and lemon zest” and I took “unsalted butter, melted” to mean “browned butter”. Because that’s what I always do. And I’ve never regretted it. And so on round five of Something Early Summery That Will Make You More Welcome Anywhere You Go This Weekend, I finally have something to file within the category. 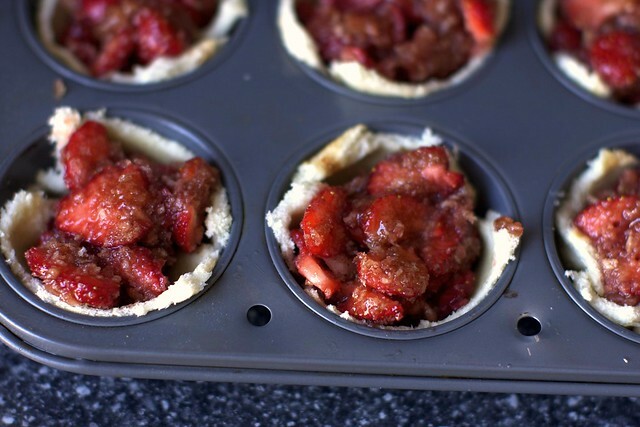 If those rhubarb tarts were “rustic”, these are, um, “primitive” — white bread for crusts, bread crumbs for thickener, dark brown sugar for glue and browned nearly to the point of burning oops butter that made us happy with every bite. Need another reason to make these? The baby, given his very first fingertip taste of whipped cream, proceeded to lunge with a force and ability to crawl forward heretofore unseen, at the plate of dessert. I like to believe that these bettys can have that effect on anyone. More things with strawberries: In the new, even-more-obsessively organized Recipe Index, replete with the ability to pull up recipes by individual fruit or vegetable. CSA people, I was totally thinking of you! In a small pot, melt butter over medium heat. Once melted, reduce heat to medium-low. The butter will melt, then foam, then turn clear golden and finally start to turn brown and smell nutty. Stir frequently, scraping up any bits from the bottom as you do. Don’t take your eyes off the pot as while you may be impatient for it to start browning, the period between the time the butter begins to take on color and the point where it burns is less than a minute. Remove from heat. Lightly butter muffin cups with some of brown butter, then sprinkle with granulated sugar. 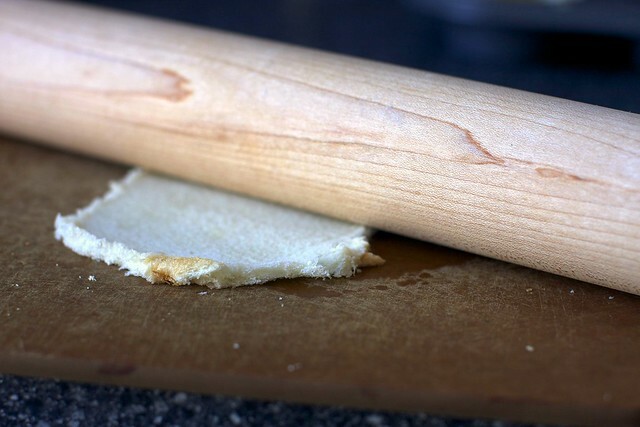 Roll bread slices with a rolling pin to flatten. Brush both sides with additional brown butter, then gently fit into muffin cups. Stir together brown sugar, zest, salt and panko, then add strawberries and toss to coat. Stir in remaining brown butter. Heap strawberry mixture into cups, pressing gently. Cover pan with foil and bake 15 minutes. Uncover and bake until strawberries are very tender, about 10 minutes more. Let stand 5 minutes before removing from pan. Serve warm or at room temperature. * Make your own panko: Sure, it’s not exactly the same thing but I’m convinced that you can make very panko-like crumbs if you do the following — Preheat oven to 350 degrees. Tear one to two slices of soft, crustless white bread into 1-inch pieces and pulse them in the food processor until coarsely ground. This will make a generous half cup. Transfer crumbs to a rimmed baking sheet and bake until golden brown and dry, about 15 minutes, stirring occasionally. Cool. Use. **Sweetness: [Updated 5/28/10] I “tested” this recipe with local, early-season not overly sweet strawberries. However, the ones you have may be sweeter. If you think your strawberries are on the sweeter side, you might want to dial the brown sugar back by one or even two tablespoons (the two tablespoon level, especially, if you like barely-sweet desserts). Hope that helps! Looks amazing! Great tip on making Panko. I was trying to think of something to bring to my nephew’s graduation party this weekend! Yum! I can’t wait to try these before strawberry season is over! I wonder how they’d taste with fresh peaches. I’ll bet delicious! You are truly dedicated… It is so hot in Chicago I cannot even imagine turning the oven on! Wow! 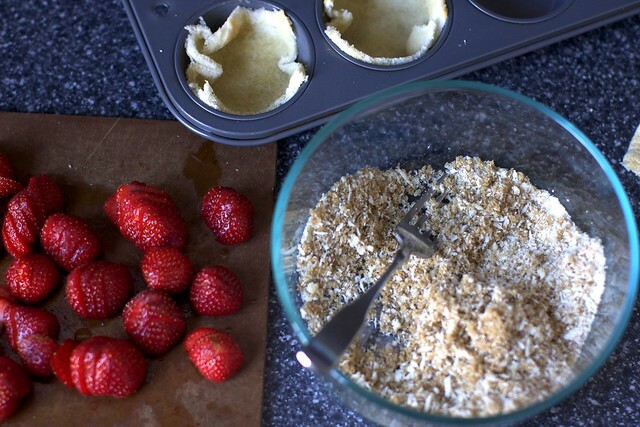 A feasible weeknight dessert made from pantry stables (if your pantry includes delicious in-season strawberries, I mourn. :)). It’s genius and simple; perfect! Thanks for sharing, and kudos on raising a fresh whipped cream loving kiddo. As I was reading I couldn’t’ help but think, how about a little sweetened cream cheese in the bottom before adding the strawberries? Because I love to add calories to an already fabulous dessert! Interesting recipe and they certainly are beautiful! I love panko breadcrumbs and appreciate the homemade tip. That last picture totally reminds me of those spongy cake cups my mom used to buy at the grocery store. I’m sure they’re are a million times better than those cups, but that’s the memory I get. Perhaps I will try this with some homemade bread! I laughed when I ready “the baby” (as in “you gotta see the baby”) because it reminded me of THAT Seinfeld episode! These look sooo good…I will be doubling the recipe and making for a party this weekend. Thanks for the idea! I always get asked for the recipe when I make something from the Smitten Kitchen. Looks good, gotta try that one. bodega? I had to look that one up. Thanks! To reiterate my comment on one of your Jacob pics on flickr: we need video! Ooh – I love all desserts involving strawberries. Especially ones that seem do-able for my level of skill! Looks like your substitutions worked out for the best! What a tasty, easy dessert you’ve concocted! I just got some perfect, juicy strawberries – these are up next! I’m loving that strawberries are in season right now. I can’t help but put them in everything! Neat! Thanks for the “make your own panko” idea. It never occurred to me to try it, but I like the idea. I should reitorate that the Make Your Own Panko thing is really a different animal; panko is panko. But when I’ve made bread crumbs in that manner, they’re the closest I’ve ever gotten to that craggy, light crunch you get from panko. So, it will be close even if no cigar. I won’t tell you how old the panko crumbs I used in this recipe were but if you want to scare yourself, try finding the last recipe on this site that used panko. As in, very old. I will make these as soon as I move into my new (with air conditioning! and a DISHWASHER!) apartment next week, as I’ve already packed my panko. Yum, what a wonderful flavor combination! I’m so glad you named your course crumbs Panko here. I’ve been too shy to do that with mine because I use a course french bread to make them and they look like’em, but the bread isn’t japanese. Whatever! They work exactly the same! I haven’t made Brown Betty in years and have been looking around for a good recipe but have been holding out until cherry season this year. And it’s here! They’ve just started showing up at the mkt, so I’ll adapt this recipe. Can’t wait! Do you think I should give them some heat first, since Bings are firmer than strawberries? I heart somewhat trailer parking recipes. In most things I cannot stand overly processed foods, but there is this soft spot in my heart for the delicious and kinda low brow. Casserole with Campbells Soup? Sign me up. Wonder Bread dessert? Yes please. I want country music playing while I make these. And to be wearing cowboy boots. This looks delicious! I bet it would be equally perfect with cranberries. i wonder how these would be if you tossed the strawberries in a little balsamic vinegar before you tossing them with the panko mix… i always love that combo. the crust of white bread is intriguing. I was looking for a dessert for a picnic this weekend, and this one is on the list! Stir together with brown sugar, zest, salt and panko, then add strawberries and toss to coat. Stir in remaining brown butter. and zest, tossing to coat. Stir in panko and remaining melted butter. Heap strawberry mixture into cups, pressing gently. Deb, I’m kind of confused by this above paragraph. Is the instruction to add the butter, zest, and panko to reserved portions? Thanks in advance for clearing it up. These sound amazing..I will be making them for a BBQ this weekend for sure! These look so good. We are still waiting(anxiously) on the east coast for strawberries to come into season, but when we finally get them, I will be trying this one! Susan/CookToSave — Where are you? I bought these at the farmer’s market this week; they were grown in South Jersey. Susan — If cherries, you can just bake it longer. Original instructions were for apples; 30 with foil, 20 without. Your cooking time will be somewhere between the strawberries and that, closer to the strawberries. Chiara, JF, Dawn — All cleaned up now. There were some sentence scraps left behind on the chopping board! Wow – this recipe looks awesome. I’ve never had a betty before (twss… haha) but they look great!! Oooh, I’m just about to post my rhubarb betty recipe. These look mouth-watering. I’m drooling all over my keyboard. If I were to make these Friday night to bring to my MIL’s vacation rental Saturday morning — would they be best on the counter in an airtight container or fridge? I can’t wait — they are right up her sit-by-the-pool-and-grill-dinner alley! Hahahaha, I like your no regrets attitude. Especially since it makes these delicious little bettys! Awww Deb, now I’ve got a hankerin’ for a Brown Betty bam-a-lam. Hope to be trying these sooner than later with some fresh strawberries. I bet blueberries would be good too, then it could be called B4 (little upperscript 4) Blueberry Brown Butter Bettys. I am totally going to give this a try tonight! I love the thought of baking up these cuties without the hassle of preparing pastry dough. You’re giving me hope! I feel like I’ve lost my cooking mojo after a string of only oks and a couple of tending-towards-failures but if it can happen even to you then who is anyone else not to soldier on? i might just have to make these TONIGHT! How much zest and panko do you put in with the brown sugar, zest, salt and panko strawberry mix? When you say to stir in panko do you mean the entire above mentioned mixture? oops – sorry deb – you must have been posting the reply as I was typing my comment. Thanks! Those look easy and delicious! My kids would love those! This sounds amazing (and quick). Of course, we don’t have squishy white bread in our house, because I love my uber-fiber breads. I might break down and buy the squishy white, or just try it with the fiber bread anyway. Thanks for the great recipe. I was on the search for something yummy with strawberries and here it is in my inbox. Thanks, Deb. Jacob gets cuter every day. He reminds me of my son before he could walk and had all this extra baby rolls. So sweet. I am so happy that this week officially begins the start of summer, its my birthday and I will gladly be taking these to my party over the rainbow sprinkle cupcakes I had planned (im turning 26 not 6 but i cant stop loving those boxed Betty Crocker creations). These will make it seem like the sun is finally out in San Francisco, even though it will only be shining behind the clouds. These look SO good. I’ve never made a betty before, because I thought they sounded like a kind of less-tasty crumble, but !! 6. I’ll edit that in. I think it makes six, as there are six slices of bread for you to line the tins with. Right? You have made me laugh today. I love your sarcastic humor! Anyway the strawberry brown Betty’s look delicious. Thanks for cleaning up the sentence scraps and fixing the recipe, Deb! Definitely making these this weekend to take to a cookout. The strawberries have been really delicious this season, and I wanted to try something new! Thanks! I could even make these for two servings only! How perfect! I cracked up when you said your little man lunged for more after tasting whipped cream for the first time. That moment should be filmed! How sweet! It was kind of eye-opening for me, the first time my niece tasted sugar (in the form of ice cream). She was a giddy, obsessed 9 month old! The look on her face was priceless, and she wanted the ice cream, damn it. It made me realize just how much we are biologically driven toward high-calorie, high-fat foods, especially when they are in the form of sugar and dairy. Yum. Now I want ice cream. Or just a big bowl of whipped cream. YUM. I need to make these… asap! This recipe is wonderful. I love dessert recipes that aren’t too sweet and don’t rely on sugar alone to flavor everything. Fresh fruit does most of the work for you in the flavor department. Plus natural flavor is the best flavor. This recipe looks wonderful, and–like you–I’m a sucker for dessert recipes with interesting names, which means this will go to the top of my “must try” list! mmmmyumyumyum, gotta make this right now. Brown butter might literally be my favorite thing in the whole world. i read strawberries and brown butter and i was already hooked. must. make. now. This makes me laugh like hell. I don’t know why. The Wonder bread, perhaps? It’s the kind of thing I will now have to make. Oh my. Yet another delicious fruity thing to try. I like the new and improved recipe index a LOT!! When that baby gets older, will you buy a can of whipped cream and teach him to squirt it directly into his mouth? It’s what bad mothers do and their sons love them for it. Hey Deb! I’ll make these when I can stop stuffing my face with the fresh strawberries I’ve been buying. The Berkeley farmer’s market just had a strawberry tasting table last week but I’ve eaten all of the ones I bought on Saturday. I find farmers market strawberries spoil pretty fast so I just eat them as fast as I can. Like I needed a reason! I think I’m having an off day because everyone has mentioned it and you’ve fixed it already but I don’t understand the sentence “Stir together with brown sugar, zest, salt and panko, then add strawberries and toss to coat.” What am I supposed to stir together with the brown sugar, zest, etc? Or maybe I am supposed to read that as stir together with the brown sugar the zest, salt, etc? This dessert (and the baby) are both gorgeous, but that new index is a gift. Thank you! These look deliciously easy to make, I am intrigued. I’ll probably try making them with cherries, blueberries and gooseberries. On another note; I left a comment on the braided lemon bread asking about conversion problems. I would still love to hear what your advice on this is, even though you chose not to publish said comment (I probably accidentally broke one of your comment rules). Dainty — I responded over there. I think it was rejected by the mean spam filter for having 3 links in it. I usually catch the misplaced rejects but missed yours. KatieZ — Nope, some gibberish still left in there! I’ll fix it after my newly-toothed unhappy son goes to sleep. In short: You’re mixing everything together, first dry, then strawberries, then butter. Laura — Thanks, will fix too. Looks delicious! My mom is strawberry averse but would love this. Could I sub raspberries or blueberries? How would the recipe/cooking time change (if it would)? Thanks! I LOVE your site! Lovely looking bettys. Strawberries are right for the picking so gotta get these on quick. I’ll probably give them a whirl with blueberrys as well. Cute! So cute! And, personally, I love a dessert that’s easy to alter the serving size. The last thing my husband and I need is a bunch of these little jewels hanging around! You know, I don’t comment often because what you do is so far beyond my current level of cooking experience that to attempt anything you do would likely leave me in tears. I’ve just discovered how much I really, really love to cook and it’s a joy whenever something turns out right. But the ‘wrongs’ are so frustrating because I never know what I did wrong, or if it was me or the recipe. So when I see you talking about things going wrong in *your* kitchen, you have no idea how much better you make me feel. Everybody has bad days, and I’ve had some recipes turn out so marvelously that the sounds at the dinner table are all incoherent, because nobody can come up with words good enough. Meanwhile, thanks for your gorgeous, gorgeous recipes. I keep reading because one day, I hope I’ll have the knowledge, experience and talent to be able to make the things you do. I’d like to invite you to win a piece of my fine art through a giveaway on my blog. I wish you all my best. Deb, can you please stop using white bread in everything?! I hate you for it. I can’t eat white bread for the life of me… too much guilt and tummyaches ensue. these look gorgeous. unfortunately in australia strawberries seem to be losing flavour by the day. we are, however, in pear season. not sure if they are a bit too hard to work here. do you think if i were to substitute strawberries for pear i should poach the pears first to soften them up? not quite sure what texture the fruit needs to be? I love it when something so good is quite simple saying, “I’ve been here all along!” Thank you for recalling your mistakes as well–it reminds me how we’re all human. And whipped cream will do it for those little ones–love it! Thanks for wonderful memories. My great aunt from Switzerland used to make a dessert that featured good-quality white bread slices browned in butter on both sides, topped with sweetened sliced strawberries, and unsweetened whipped cream. Once a year, during berry season, my mother would make it for supper, nothing else, and let us eat all we wanted. Strawberries are ripe now here in Oregon, and guess what this old girl is making pronto! I am always unbelievably excited by your recipes. This dessert looks delicious. I love all kind of berries, and strawberries is the queen. so happy i read this, as it lead me to your pinkcherry yoghurt recipe from years ago! i made it for dessert just now, not using an ice-cream maker but rather a tray and a whisk. in addition to feeling like a pioneer woman i also impressed my lovely co-hort #Schlepseleh, no mean feat mind you. What a great recipe. I love strawberries in almost anything, so this is the next thing for me to try. Thanks for the panko tip! Oh, my god! Oh my god! OH MY GOD! I’m spasming over hte words “strawberry” and “brown butter” right now. Excuse me while I freak out. Wow, these are good. Made them tonight with things I already had and it was very quick and easy dessert. My little fruit monster loved them! Also, I didn’t have any Wonder bread so I used some whole wheat bread and whole wheat white and they were still good! Deb, these look amazing, as do all of your recipes. My inner copy editor cannot help pointing out that it’s “through the wringer” not “ringer.” My inner baker is itching to try to replicate your lovely work! So for I haven’t had enough to consider trying this but I thought you might. Jam and toast is my favorite thing so this can’t be bad at all. Ariana — Actually, it was from the New York Times archives; I’d bookmarked it eons ago. I’ve been burned by many many newspaper recipes. I don’t believe that they are tested. Jennie — God, I have been staring at that ALL DAY and it bothered me but the baby woke me up before 6 this morning (with a tooth, and fever, and a leak, aargh) and my braid has been a puddle since. Will fix, thank you. Melissa — I want apricots! I have noticed (from baby food making) that stone fruits seem more prone to bubbling up and over. I can’t attest to the food science of this but I’ve only had this problem with stone fruits. Oh wow. If I could eat bread (gluten-free) I would make these immediately. Still so fun to look at though!! Deb, I promise you this recipe is anything but a dud: you must try Nigel Slater’s recipe for a strawberry tart. I’m writing this from a coffeeshop so don’t have access to my cookbook collection (!) but I can tell you it’s from The Kitchen Diaries, has a wonderful crumb crust made from crushed orange shortcake cookies(Duchy Originals work beautifully but any other buttery cookie would work too), a mascarpone filling and is simply topped with wonderfully ripe, sliced strawberries. Have I convinced you yet?! I love how this uses pantry items. Will definitely try this out soon. Hurt foot and all I walked to the store to buy some white bread and heavy cream. And totally worth it, these are delicious! These look incredible. I got the very first strawberries of the year in my CSA share this week and can’t wait to make to make these. I’m going to my parents house for the long weekend and would love to bring them – I wonder if these can be made a day ahead? Or will they get very soggy? Ours were fine on day 2. They did not make it to day 3. I just wanted to give you my professional librarian stamp of approval on your recipe index reorg. Nicely done! These look great! Actually, anything with brown butter in it can’t be bad! 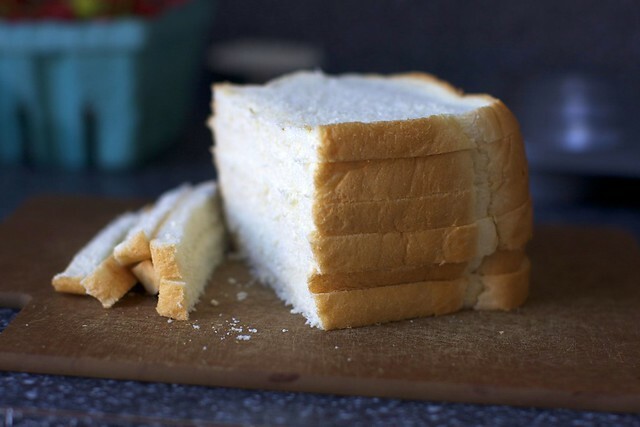 I may have to try it with gluten-free bread – I’ve got a store-bought loaf that isn’t very good for eating on its own, but underneath all that fruity goodness, it may just find redemption . . . thanks for the inspiration! hmmmm…. at first i wasn’t so sure i was going to enjoy this, given the rolled out bread slices, but after seeing it and reading through the commentary, i gotta say, i’m sold! the brown butter doesn’t hurt, that’s for sure! I just made my own bread crumbs this weekend using the method you suggested! It worked very well and I can see how it would be a good replacement for panko. I think I just fell in LOVE. Yummy! I need our strawberries to be in season. Now. Yummy! This looks divine and so simple. LOVE! Copy and printing as we speak. THANKS! i’ve never heard of a betty before! they look and sound deliciously simple and tasty. Squishy white bread or the good stuff? Ok, you can really tell that I haven’t grown up in the States when you know that I had to do a google search to realize that a brown betty was a crumble…I feel silly. I’m very inspired by the sandwich bread crust. Thank you for sharing your source. My mind is wizzing with ideas. I’ve never had any panko breadcrumbs so I can’t really grasp what’s the big deal…I really must try and get my hands on some. Living above a bakery in France I never even tried to look further for breadcrumbs! Nah, just kidding, we can find it here, it’s just nobody eats it! I’ve got some strawberries are waiting…time to sign off! As soon as I saw these I knew I HAD to make them, especially sine I had half the ingredients on hand! When I do them again I think I’ll use granulated sugar instead of the brown (or maybe half and half) and add some lemon juice in place of 1?2 the remaining butter since my attempt was pretty sweet. My husband LOVED them, but since I like a more sweet-tast taste with strawberry baked goods, this was a bit much for me. Kind of like frosted cereal with strawberries. To each his own, and I’ll do them again (with mods) for sure! Thanks! Oh yumm… Deb, can you put peaches and cherries through the wringer next please? LOVE these! I’ve been like this with strawberries this season, and now we’ve moved into stone fruit mode. Just cannot get enough of cherries, peaches and apricots …this is a delicious post! Oh my goodness, those look so tasty. I have honestly never even heard of brown betties but I bet I would love then! I have been dying to bake, but it’s soooo hot in my apartment. Uugh. Magic – I wish strawberries were in season here!! Hey there, these look wonderful! I moved to South Jersey mostly for the produce! The strawberries are the best, the asparagus is delightful, and oh my, the corn. ….I once had the idea that i would eat nothing BUT south jersey produce and locally produced eggs…..but i didnt do it. One day it will happen! Could I make these with normal breadcrumbs? They’re pretty fine- not coarse like Panko. How much should I be using? These look fabulous – I’m always on the lookout for good strawberry recipes. Which stand did you buy from at the Greenmarket? Last year I bought mostly from Mountain Sweet Berry (those guys who sell mostly potatoes.) They turned out to be the most reliably fresh and sweet berries all season. Susan — Kernan Farms. They set up in a smaller market in my neighborhood on Tuesdays, Union Square on Wednesdays. I aim for Tuesdays, this week bringing back armloads of asparagus, peas, sugar snaps, spinach, yams, scallions, onions and strawberries. I give these strawberries an 8. I like the idea of the white bread as the crust. I honestly have never seen that before. The look and sound beautiful , as always. I’ve been cooking up a LOT of strawberry recipes as well! First, you are my hero. I aspire to your blogging greatness! (just sheer consistency of entries alone, never mind the amazing recipes and wry style.) Second, the “primative” bread as pie crust was actually shown to me by an award winning French chef who was one of my teachers at French Culinary Institute. Only he said “iz good for queek to make petite quiche.” I’ve used this method to turn out fawned-over muffin pan quiche..but since my thing is trying to turn every recipe into a little bit healthier fare…I use whole wheat or whole grain bread, or at least try to find some white bread make with unbleached flour. I became thusly obsessed when my son was Jacob’s age…21 years ago. Love the pics of him! Thank you so much for the new recipe index! It is SO HELPFUL to have it arranged by fruit/vegetable, and by seasons. Also, I love that you have a “disasters” category. It’s also nice to read about how many recipes you go through before posting. Makes me feel better for my misses! The strawberry rhubarb crumble you made years ago is my go to when the strawberries start hitting the farmers market. It never fails me so I make it all the time. This is tempting though. It is the wonder bread. Thanks for sharing! Oh Deb, these look sooo good! I wish I’d seen them earlier, though! Ok, now I’m torn between these and the rhubarb tarts – I’ll leave it to the universe and make what I see first in the market – strawberries or rhubarb. Or perhaps both? Hmm.. Question: Always been curious, does anyone know why it’s called a Brown ‘Betty’? Oh my! These look so good. I want them NOW! Oh wow, these look fantastic! We have an outdoor farmer’s market that runs from late April. I can’t wait to pick up some fresh strawberries and make this. Thanks so much for sharing! Those look awesome. On an unrelated note, I received an email from Saveur magazine with their list of memorial day cook out recipes and your grilled shrimp cocktail is first on the the list, wasn’t sure if you were aware, so I’d thought I’d pass it on. Your site is great! I love this idea. “Me and strawberries are going through” – check your grammar though. Oh my. YES. These look incredible, and I want to swing an invitation somewhere this weekend just so I have an excuse to make them. I think they would be the perfect compliment to those little individual Blue Bell ice cream cups, that come with their own tiny wooden spoons? I had those at every summer birthday of my life. God Bless Texas. And then maybe I’d make them again for breakfast. I want to try this this weekend, but wondered if it would work baked into small mason jars for portability (and cute factor)? Also book marked it for the fall with challah and apples. thanks and your zucchini fritters were a hit last weekend! 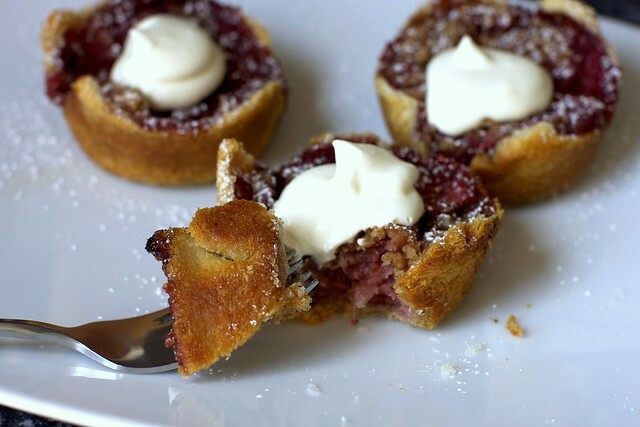 I am soooo deathly allergic to strawberries, but I think the idea of a blackberry browned butter betty sounds awesome (and awesomely alliterative). Am I the only person who saw the link that said you working on a cookbook? ‘Cause nobody seemed to mention it here. I have gotten a lot more particular about my cookbook buying these days but I would definitely buy one if you wrote it! Woot woot! Deb these look so amazing and I also like the fact that there are only a few ingredients…. I am going to try and make them together with everything else you post…. I cannot keep up! These look amazing! I’m filing this one away. Also, congrats on the cookbook, I can’t wait! There are strawberries in South Jersey?!!! 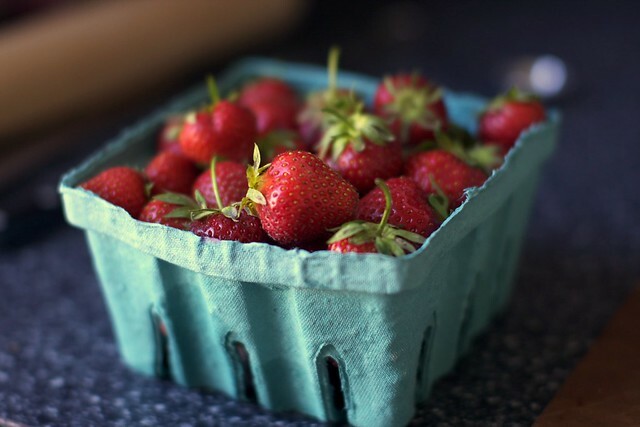 (I am a relocated Jersey Girl :)) I am in northern CT… any day now strawberries will be ready. We are always a little behind the rest of the country! I think I know which New York Times shortcake recipe you’re talking about: sour cream, cream cheese, buttered center, total dud – is it the ‘Strawberry Sour Cream Shortcake’? Ugh, I made that recipe a few months ago and it was bad. It wasn’t sweet at all and actually tasted a little salty to me. It’s in their dessert book too. That book has some really great recipes, but that shortcake was a total loser. But, back to the topic at hand, your little betty’s look great! Love those primitive tarts!! Primitive is good. It means they swere made by hand with love and not from a factory. I made the rustic tarts last week and added strawberries, blueberries and rtaspberries to the filling. They were so GOOD!! Made a double batch and froze them to serve again this weekend. P.S. I gave 100 moments of silence for Gourmet. I still can’t bring myself to unwrap the very last issue from the plastic it arrived in the mail in. CRAP! I am so sunk. These bettys look terrific. I love the color on the crust. This is exactly the kind of thing I would (will!) make. Simple, tasty, and pretty! Thanks for the panko tip. So excited to try this! I currently have eleventy-billion strawberries on the premises. Good on Jacob, that boy has his priorities right. Genius! I was just wondering what to take to tea at a friend’s tomorrow – these will be perfect, I have a big box of raspberries in the fridge and some homemade sourdough bread to use up. I even have some clotted cream to dollop on top. Mmm. Delicious! Made them last night. So quick and simple, and infinitely adaptable. Thanks, Deb! Yum! Just made these with oranges, which made them a little bit odd, but we didn’t have any other fruits at home and I couldn’t be bothered to leave. That shows another great thing about this recipe- the main ingredients are bread and butter, and who doesn’t have those at home? One thing though- does anyone have advice for not getting butter all over your hands when you’re brushing it onto the bread? It wasn’t too big of a deal, but I couldn’t get my hands on my camera while I was buttering it. Brown butter betty is a beautiful thing. I used thin sliced white sandwich bread and less of the sugar/panko/zest/butter mix than you suggested since I don’t like things too sweet. I topped them with a melon baller size scoop of vanilla ice cream and had to ask for intervention so I wouldn’t eat them all. Thanks for the sandwich bread crust reminder. Re: sweeteness — I should add have added this at the end of the recipe as well. Strawberries definitely vary in sweetness levels. I “tested” this with early-season local strawberries; they were not particularly sweet, though they have that wonderful complex flavor you get when they’re fresh-from-the-ground. But I’ve also had a plank (crate? it was 4 obscene pounds) of Driscoll’s in the fridge that I couldn’t resist* and they were delicious but very sweet. So, I advise you to taste your strawberries and adjust the sugar accordingly, maybe dial it back to 2 or 3 tablespoons of brown sugar if your strawberries are on the sweeter side. Hope that helps. * Side question — What kind of fruit do you all eat when almost none is in season? I realized I was going through an almost fruit-free few months (before strawberries arrived), trying to eat mostly seasonal produce, and it made me sad so I bought strawberries. But I am wondering what others do. In answer to your side question, Deb, regarding fruit when almost none (or, at least, the funner stuff like berries and stone fruits) is in season: I eat apples almost daily, OR I stick with dried fruit (apricots, bananas, and barely-sweetened cranberries are my favorites, I suppose), OR I just don’t eat fruit but once or twice a week. And about the term for a large amount of strawberries: you used plank and crate, but I think most folks around my part of the midwest say “a flat of berries”. It’s a volume, rather than a weight, definition, so that one may have a flat of raspberries or a flat of strawberries and still refer to the same thing. Oh! I forgot fresh/frozen cranberries! Before I moved to St. Louis from Madison, I bought bags and bags of cranberries during the precious few weeks that particular vendor came to the farmers’ market. (The best deal was four one-pound bags for $10. Oh, how I’ll miss that come this fall!) I always stashed them in the freezer immediately, then used them in all sorts of ways. In fact, when I moved two months ago, I still had a half-pound left — and you can bet it made the long drive with me. We used it just recently in making multi-berry freezer jam, a St. Louis-Madison hybrid in a jar. A quick question – where do you find Panko bread crumbs? We don’t have a food processor or blenders, so it would be difficult to follow the recipe to make your own. Can you fin them at the regular grocery? I have to admit – this is my first time hearing of them! Are the bread crumbs completely necessary or can I subsitute or omit altogether and still have a delicious treat? I try to use fresh local produce as often as it’s available (in CA, it’s often!) but this ‘fresh and local’ ideal is just that; an ideal. I refuse to feel guilty or deprive my family of good fruits and veg’s, for an ideal. I lived in the DC area once, and I would have developed scurvy if left to eat only local produce for 8 months of the year! I don’t feel I’m depriving the local small farm of a living by buying outside my locality during their off season. Common sense and Whole Foods, in all other seasons! Definitely looks like this one is a winner – gorgeous! oh my goodness, this looks too good. I know what I’m going to be doing this weekend now. I love the muffin tin idea. Looks so cute, and it’s portioned out for you! Except I’d still eat two. Or three. If you’re not looking. Erin from MS: I’ve seen panko in bags and boxes, but not cans, and I always see it among the Asian and Asian-influenced ingredients. Also, if you’re near a World Market, they’re a good (if slightly pricy) source for panko and other slightly unusual ingredients. I found Panko at Whole Foods and I believe even Gristedes (a regular grocery store) once in New York. But that’s New York for you, right? hey deb, is there a way to “favorite” the recipes on your site? i feel like i’m constantly forgetting all the good stuff i want to make! I’m making these tonight for a birthday dessert. I’ve left the screen open since you posted it for fear of forgetting. blargh! How could I ever forget browned butter and strawberries?! I’m incredibly excited and I’m thrilled that the crust is made out of bread. Really … does it get easier? I’m not much of a baker so you just simplified my life. It still looked delicious. Here’s hoping I adjusted the temperature of my avocado-green 30+ year old oven correctly and don’t wind up with burnt strawberry-toast cups. Lillian — I cannot imagine an oven more appropriate for an old school dessert like a brown betty than one that is 30+ years and avocado green. Love it! ok so I made these last night – and they were so so good! I didn’t have any strawberries – so I reverted back to the original apple, and threw some oatmeal streusel on top (more butter and sugar is always good!) and now they are all gone – and I can’t wait to have an excuse to make them again! Thanks Deb!! These look FANTASTIC! My daughter is strawberry obsessed, and I just know these would be loved. Looks wonderful!! Interesting using the bread for the crust. I bet its fabulous! Answering the “what fruit do you eat when nothing is in season” question: We always will go for bananas (when ARE they in season anyway? Seems they’re always in the stores…), but also frozen fruits! I’ll bake with them, or I’ll thaw some out and put them in ice cream or yogurt… mostly cherries, blueberries, or peaches. I read about 10-15 food blogs, just looking to get ideas and read awesome stories, and in all honesty your book is the first I’m dying to buy from any of them. Nothing on them, I just love your writing and recipes that much. Congrats!! I just made these with croissants instead of wonder bread (would you like more butter with your butter?) and a dash of vanilla extract. Took ten minutes to throw together with things I already had in my kitchen. Awesome! These babies are in the oven and if they taste anything like their uncooked filling then I am going to be a happy camper tonight! Love smittenkitchen! @Erin from Mississippi–If your local grocery doesn’t have an ethnic foods section, or doesn’t carry panko, try going to your local seafood market. It should be next to the nori and Old Bay. jacob lunging for the whipped cream makes this post so adorable! never made soemthing quite like this before. It’s amazing how butter–when browned–can take on such a nutty, rich flavor so unlike its normal taste. How do you think brown butter as a process was invented? I can imagine it being a delicious mistake: someone meaning to heat up a nice, generous pat of butter, leaving it over the heat source a moment too long, fretty about the mistake, then tasting it and realizing there was something magical in the pan that needed to be explored. Well those look just fantastic. I am supposed to be making a birthday cake today anyway but I might try and sneak these in while my other half isn’t looking as well! And VERY exciting news about the cook book! I can’t wait till I can buy it. If it’s half as useful and beautiful as the website then it’ll be amazing! Deb I feel your pain about out of season fruit! During the in between months I keep it to apples. Which frankly aren’t that great all year long, but doable. And then we always have bananas and oranges. I find that even when out of season the big thick skinned navel oranges are usually really good. I’ve been tricked by “gorgeous” looking out of season strawberries, and it’s is never great. Often a pineapple that sits on the counter for a few days is really great too. I actually just made your pineapple upside down cake with my pineapple that had been sitting around for a few days! It was a hit! Well, this was my first “real” baking/cooking experience ever!!! Just letting you know I made these last night and they were fabulous!! I used the strawberries from our CSA and made 3 blackberry ones. YUM! I made breadcrumbs with wheat bread and upped the lemon zest a tad. thanks for a great recipe!! and we had the with our coffee this morning too…. Oh my. These look fabulous! i wonder what you think if preparing these for baking, but freezing them for a couple of days, so i can bake them on the day we want to eat them? just worried my berries might go bad if i don’t bake or freeze right away. what do you think? yum! I can’t wait to try these. Your pictures are beautiful, by the way. Another super-easy use of fresh strawberries is to mix them with balsamic vinegar, some mint leaves and a little sugar, let sit, and use as a sauce for vanilla ice cream ( a very sophisticated yummy). I need to make these, as soon as possible. I love how creative you are with adapting other recipes into something completely different! deb – finally someone who doesnt just quote they looked good, i cooked these thinking one each was enough after lasagne dinner and my boyfriend loved it and had 3! delicious. i think i might try raspberries and blueberries next time. thanks for a great idea.you are a true improvisor. Hello Deb! These look great – do you think it would work to line a pie plate with a bunch of bread and make it into a pie sort of dessert? So, I haven’t found Panko yet as the nearest Whole Foods is in New Orleans (45 mintues away) and the same deal is with seafood market and grocer even though I live on the coast – I will see if I can pick it up when I am in New Orleans..
…but to what I really meant to say was that I made these whithout the crumbs and they were so tasty! I think next time I will do a mix of berries for variety. Thanks for this simple recipe Deb! Easy is best in my house with a hungry husband and 4 month old! Thanks for the inspiration! Over the winter we eat all the frozen peaches, blueberries, and strawberries that we processed the year before, but then I live in a large house and have a stand up freezer! I have these bettys in the oven right now…I only had a few strawberries, enough to fill three so I put some lightly fried leeks, spinach, crumbled turkey and sage sausage and baldersons white cheddar and then cracked and egg over that mixture for the other three shells. Can’t wait to dig in! I don’t think I have enough to do just strawberries, unfortunately. Any idea how much modification would be needed to make these with strawberry and rhubarb? Should I add more sugar (my berries are reasonably sweet)? Do I need to change the cooking time at all? Any tips would be quite welcome! I made these for our Memorial Day get together last night. They were well-received, but I was disappointed with the texture of the crusts on mine. I made them in a silicon muffin mold, and I’ve had trouble with texture in them before. I may just go back to the old-fashioned metal pans! I am intrigued by the suggestion above to use savory ingredients, so I just may have to give these another visit. Anyway, I posted my moderate success with this very interesting recipe concept on my own blog. Thanks for so much inspiration! oh yum! oh these look good! These were simple and tasty! Thanks for a recipe that can be put together quickly on a weeknight. I gave in and bought some mediocre grocery store strawberries to supplement my market ones so I could make this. They were quite good, although it seemed like kind of a lot of butter. Maybe I just needed more berries, though, as I only used about 1 1/2 cups. And I think mine could have served to cook for a shorter time–the crust was quite crispy (which was nice) but the innards were a bit squishy for my liking. I made these for breakfast Sat. morning. I thought I had bread crumbs, but it turned out I didn’t- so I ground up some Oatmeal Squares cereal in the food processor, instead, and added a bit less brown sugar. I really liked the flavor of that. Also, I baked them in silicone muffin trays- the only kind I have- but think that metal would have worked better- they did not get very crispy on the outside at all. Even considering the changes, my husband was a huge fan! I made these for a dinner Sat. night, and they are delicious! I doubled the recipe so I had 12 instead of 6. The bread “crust” was a little softer than I was hoping it would be, but oh well. I probably should have baked a little longer but I ran out of time. I also served them room temp as I made a couple hours beforehand. Although the one I snuck and ate soon after baking was better, they were still good later with a little whipped cream on top. Yummy! I just want to thank you again for another FANTASTIC recipe! I’m not a baker, I wish that I was and I love reading your dessert and baked good recipes and then send them on to all of my baking friends hoping they make them for me. This one, however, was perfect for me. White bread as my “dough”? Perfect! I made these this weekend and took them to one of my closest friends and her husband who just had their first baby 8 days ago for dessert and they were just divine – thanks again! I bake every week for work. I usually do Friday’s but sometimes I surprise the office and bake during the middle of the week for a little boost! I made the Brown Butter Betty’s this past Friday and they were a hit!!! The company I work for has a produce side to it first so I got fresh strawberries that made this treat even better! I love this website and cannot get enough of it! I made these as well and stuck to the 6 in case they did not turn out well or no one liked them but they were all quickly gobbled up and everyone wondered why I did not make more?! So next time I will double it! To answer your side question Deb, in the off season, we eat mostly apples and bananas, and dried fruit. I made this last night. They were fantastic. I couldn’t bring myself to use Wonder Bread (I always tell my 7 year old it’s not real bread so I couldn’t very well bring it home) but I used Dempster’s oat and honey bread and a bag of frozen local strawberries that have been sitting in my freezer since last summer- it worked out very well! I’m going to try it again with the frozen local blueberries that were hiding behind them. We are in Ontario and the fresh local stawberries have just come out and I can’t bring myself to do anything but eat them fresh (not a $4.99 a pint anyway). Especially when they’re small and nummy like that. I used whole wheat bread and that worked out just fine. Yum! I’m thinking of mixing the strawberries with rhubarb next time. What a nice, quick, impressively tasty recipe! wow! made these as part of a dinner with friends tonight, and they turned out amazing. can’t wait to try this with other fruit (peaches?) as well. thank you! Thanks for posting this recipe. I tried it earlier this week, and it turned out great! Thank you for this easy recipe! I am going to make these tonight in my Redi Set Go since I don’t have an oven in my studio! Deb, I just pulled these out of the oven and am looking forward to eating them later tonight. (planning on serving with a smidgen of Creme Fraiche) I have the squash and potato torte in the oven right now. I just let the berries macerate with the sugar, then added everything else. I am looking forward to baking another batch now that the heat has finally arrived in the No. Cal. foothills. Strawberries around here have been neither very tasty or affordable. Thanks for keeping me cooking. will be frozen blocks of strawberry should have been – any hope for them? Like you, cannot stand to waste food!! Thanks! Liz — I’d use them in a compote or coulis. Sometimes the freezer seems to compromise the structural integrity of strawberries but with a saucy dish, it shouldn’t matter. My daughter made these for dessert last night. She used sourdough bread because that is what she had. She also used strawberries fresh from our garden and not too sweet. It was the most delicious dessert we have had in ages. We couldn’t stop raving about it! The sourdough bread worked really well and the dessert came out more tart than sweet which I love! Can’t remember if she said the sugarless whipped cream was your idea, but it was perfect! Thanks for sharing something unique and easy! What a concept! I just made these with wheat bread and light brown sugar because thats what i had on hand. They came out delicious! I kinda want to eat all 6 before my boyfriend gets home from work. :) Thanks for a tasty and easy recipe! These are AMAZING!! I’ve made them 3 times already! I’ve decided that i’m going to soak some apples in Butterscotch Schnapps and some fresh peaches in Dark Rum and try them that way. It sounds so freaking delicious I salivate just thinking about it. Love love love! When I first saw your photos of this I was thinking small mini muffin pan… bite sized. Then I realized you meant real muffin size. Can’t get past the mini’s so am going to try them tomorrow. Maybe quarter the slices of bread? And maybe a bit of Cointreau in the cream to dress it up? Party time. Thanks for the great recipe and the idea of making homemade panko bread crumbs! Your suggestions for making them worked perfectly with the gluten free bread. Love your site! excellent! I enjoyed it very much. This is a WINNER everytime! Everyone also swoons with how deeelish they are! like I said A WINNER! I just made these with apples. Everyone I gave them to is having a yum-attack. It’s beautiful! Thank you! I just made these, and they are so absolutely delish!! My new fav food is browned butter. I’m new to the kitchen, but these will become an old favorite very quickly! Thanks! Hey – I made these last night MUCH to the delight of my housemates and they LOVED them. I’ve gotta say that when I smelt them I was a teeny tiiny bit worried that they would just taste of butter (which they did) but MY GOD what an amazing buttery taste it was!! I think im literally going to have to go through your entire website…. Yet another successful recipe of yours! I made these last night and they blew me away! I didn’t have panko bread crumbs but I did have just plain ol’ breadcrumbs… they worked beautifully. These are probably even more amazing with panko. I ate two and my boyfriend ate three… with vanilla ice cream… mmmmmmmmmmmm. So easy and delicious. Can’t wait for your cookbook!!! made these last night and they were fantastic!!! Thanks for another great recipe! I made this for my family for Mother’s Day! It was a total hit! I doubled the recipe and actually got 18 “Betties”, so we even had a few leftovers. I can’t wait to make it again and experiment with different fruits. Thank you so much for your website – it’s my go-to for my holiday desserts! Does anyone know if these can be made up until the point of baking and frozen? I see Jenny asked the same question, but I could not find an answer. I am having a hard time fitting in baking on “the day of” these days. Thanks in advance. I haven’t done it but don’t see anything about it that suggests it couldn’t be frozen after baking. It might be best to rewarm them, so they get a little toasty, after defrosting. Hey Deb, I read through all the comments and didn’t see an answer. I don’t have Panko crumbs in hand, do you think I could put a bit of cornstarch instead, to help thicken the strawberries. Or should I use oats as others on this thread have used? Well I did make it with cornstarch and it was totally ok. however – I wonder about all the posters that say this was super easy. i had difficulty with the bread slices. If they were not rolled pretty thin, they would take all of the space in the muffin tin, If they rolled thin enough that there would still be space for the filling, they then became a little hard to manage, and broke in a few pieces. in short i am not really sure this recipe is any easier than just throwing some quick muffins in.. and not as delicious… so maybe this recipe is not for me. just adding my two cents. thank you for posting, as always.